Confident by nature, speaking is intrinsic to Sophia’s identity! 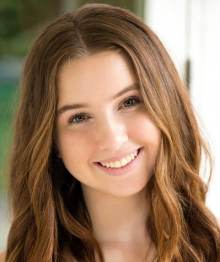 From winning speech and drama competitions from the age of four, to dominating state debating and public speaking competitions, Sophia is your girl for all things voice acting. She has a naturally sweet, childlike voice that can switch to sassy teenage at the click of a finger. Her gentle personality is reflected in her ability to entice her listeners with just the breath of her voice which she loves to channel into singing. Sophia takes direction exceptionally well as a result of years of acting experience including starring as the face of Woolworths at just four years old in an exclusive four year TV, bus, poster and magazine campaign and featuring in the TV series, Politically Incorrect Parenting. When she’s not using her voice, she’s dancing in her elite troupe, being a mathematician or tearing it up on the oztag field.